Tokyo, January 15, 2014 - Fuji Heavy Industries Ltd. (FHI), the maker of Subaru automobiles, has just unveiled the all-new WRX STI (US specifications) at the 2014 North American International Auto Show (NAIAS) currently being held in Detroit, Michigan. As the top grade model of the WRX series, the new WRX STI embodies at an even higher level the shared product series concept: "Pure Power in Your Control". Starting with the base WRX model, Subaru has equipped the WRX STI with the powerful, motorsport-proven 2.5-liter Horizontally-Opposed turbo engine, an exclusively-tuned suspension for enhanced rigidity, multi-mode DCCD (Driver's Control Center Differential) and more. During development, Subaru honed the driveability of the new WRX STI to perfection, testing it under various driving conditions in several countries. As with past generations of the WRX STI, testing included ultra-high speed road testing on Germany's Nürburgring circuit, known for its harsh road conditions. Through this process, Subaru has raised performance for the body, chassis and other vehicle areas to the limit and fused them into one. This has elevated overall vehicle performance, resulting in the pinnacle of Subaru AWD sport performance with predictable high power at the driver's fingertips. The product concept "Pure Power in Your Control" was established during development of the new WRX series. This concept aims to reach an even higher order of "absolute speed" and "driving excitement" for sports sedans, the goal pursued in successive generations of WRX series. This product concept was embodied to maximize the potential of the turbo Boxer engine and the pursuit of ultimate control performance, allowing drivers to steer the vehicle exactly as they imagine. To this end, the body has been made lighter and more rigid, integrating extensive chassis reinforcements. Symmetrical AWD-based chassis and body performance has been thoroughly enhanced to the hilt to squeeze every last drop of power out of the Horizontally-Opposed turbo engine. This is what makes "Pure Power in Your Control" possible. Steering has been made more precise with a quickened steering gear ratio and a more rigid steering system. The new WRX STI is equipped with a 2.5-liter Horizontally-Opposed turbo engine, serving as a symbol of Subaru's high performance and reliability, as perfected in motorsport. Through precise tuning, the engine produces an impressive 305 horsepower at 6,000 rpm and 290 pound-feet of torque at 4,000 rpm. On the receiving end of the powerful Horizontally-Opposed engine, the WRX STI employs a reinforced six-speed manual transmission. Coupled with short throw shifting, the combination makes driving a thrill. Compared to the existing 6MT, the new WRX STI transmission was given better tactile feedback with gears that lock solidly in place for a sportier shift feel. The WRX STI equipment package continues to come with the multi-mode DCCD system, a carryover from the existing model. This system allows the driver to freely select center differential control characteristics according to road conditions and driver's preferences. With Symmetrical AWD as a base, the body was lightened, rigidity improved and chassis performance enhanced along with VDC. All this gives the WRX STI the best hazard avoidance performance in its class, making driving excitement a safe endeavor in any scenario. 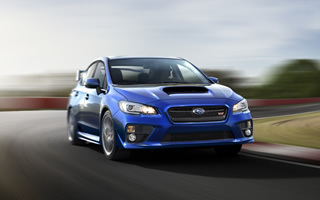 The new WRX STI employs more high tensile steel plating with strengthened joints with various structures. While helping to reduce weight, these changes also make for a stronger body with world-class safety performance in collisions from the front, rear or sides. The wheelbase has been enlarged by 25 mm, all of which was used to expand rear leg room. This gives the new WRX STI more elbow- and shoulder-room without changing the total body width. The front end was built using a nose cone design for a dynamic solid shape, starting with Subaru's unified design motif, the hexagonal grille. The intrepid shape of the new hawkeye headlights is paired with the aggressive wide and low styling the WRX STI is known for. For side design, the bottom end of the A-pillar was extended 200 mm toward the front from the previous model and the C-pillar now smoothly transits into the trunk surface for a flowing silhouette. Front fender ducts and special sharp side sill spoilers show off the sporty nature of the WRX STI. The rear design further enhances the WRX STI's appeal as a performance model. The diffuser-integrated bumper and twin dual mufflers emphasize the low center of gravity and driving performance. Specially designed rear combination lamps were given a thin shape to highlight vehicle width. A large rear spoiler also enhances aerodynamic performance and presents the top grade model of the WRX series. New alloy wheels (18x8 1/2J) were designed to be more rigid and lighter. LED lighting is employed for the headlights (low beams and clearance lamps)*1, tail and brake lights and high-mounted brake light in an effort to improve fuel efficiency by saving power. Exclusive letters "STI" rest on the exterior parts such as a front grille and front fenders. The WRX STI interior is all about high performance. The driver's seat was designed to be like a cockpit—the moment the driver opens the door, they get transported miles from their daily life. Decorative carbon trim panels and metal trim accents have been arranged around the interior, centered on the controlling elements. This gives the interior a quality feel and harkens back to the WRX STI racing image. The red accents on seats, shift lever and center of instrument panel are exclusive features for the WRX STI. For the first time, the WRX STI gets a D-shaped steering wheel for a sportier impression. The grip shape is easy to hold onto with a small diameter for improved operability and tactile feedback, making for a more appealing driving experience. Befitting a high performance vehicle, the seats are designed with superior holding ability. The headrests were also embossed with an "STI" logo on their front. Models equipped with navigation systems support Aha Radio*2. The WRX uses harman/kardon audio systems custom tuned to acoustically fit the WRX. *2 A service by the Aha Radio Division of Harman International providing internet radio and other various content.